Emed has partnered with a number of leading specialist medical diagnostics companies in Australia, America and Europe to generate a new division called Emed Integrative Medicine. Emed Integrative Medicine will provide a range of general, functional and complementary medicine pathology testing. Emed Integrative Medicine also provides specialised reference testing normally used on elite athletes or high end medical facilities. Emed members can now access highly scientific and cutting edge specialist testing. Emed Integrative Medicine pathology testing is well beyond the scope of general services routinely supplied by the ‘local GP’ and Medicare. Emed Integrative Medicine reporting is strongly science based; providing the most up to date recommendations in the field of nutritional and natural medicine. However, all patholgy and specialist testing reports generated are written in a manner that you can understand, with real recommendations for real people – just like you. We will match pathology test outcomes with nutritional strategies and natural medicine that make sense and in a manner that you can really use. No more guessing. Emed Integrative Medicine is about empowerment. By performing highly scientific pathology testing, analysing the results and providing comprehensive easy to understand reporting, we will assist you in taking control of your health. Imagine finally knowing what to eat, what to do and what to take in the management of your specific condition or pursuit of better health? Our range of scientific testing will determine the solution to your health problems once and for all. We will help you feel the best you can possibly feel everyday. Get the Facts – not opinion. We will tell you, based on current evidence, what to take and when to take it. Doctor’s Data, Inc. (DDI) a premier clinical laboratory with over 30 years’ experience, provides specialty testing to healthcare practitioners around the world. 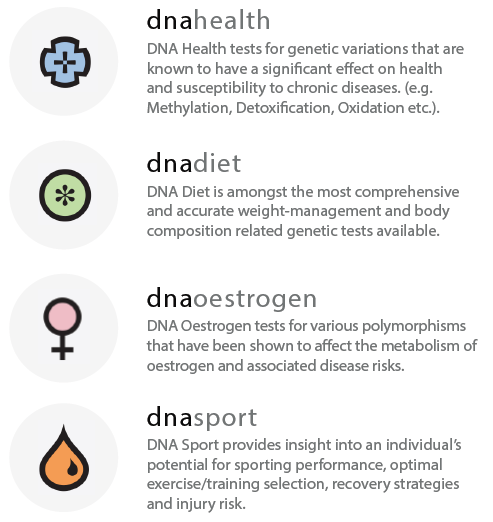 DNA testing provides the clinical foundations for truly personalised preventative healthcare recommendations. Genetic testing and nutrigenomics are the future of individualised healthcare. DNA Life comprises a dedicated team of scientists with expertise in Human Genetics, Molecular Biology, Nutritional Genomics and Dietetics. Fitgenes has pioneered a new genre of Nutrigenomic practice and education that integrates genetics, along with nutrition and exercise physiology into health and wellness programs. Fitgenes programs are not a ‘one size fits all’ approach, they are personalised by your Emed Practitioner no matter your age, gender or desired health goals for Healthy Living and Healthy Ageing. The Fitgenes philosophy is that by knowing a person’s genetic predispositions with regard to fitness, health and nutrition, combined with health and risk assessments, your Emed Practitioner can deliver personalised, strategic and targeted health and wellness programs designed to help you maximise your health potential. New FitGenes Genetic Testing Panels Are Now Available Through Emed! Want a convenient want to monitor your health without endless visits to the doctors office? Emed has developed condition specific testing profiles which are a cost effective and simple way to monitor your current state of health. ClinicalLabs is Australia’s largest provider of integrated healthcare. ClinicalLabs is a cutting edge pathology business with a major presence in all states of Australia. ClinicalLabs testing provides scientific insights into patients’ states of health and wellness. NutriPATH specialises in test for integrative medicine practitioners. These tests assist general practitioners, naturopaths, chiropractors and other complimentary healthcare practitioners in identifying the underlying cause of illness as well as providing tools for the prevention of disease and premature ageing. NutriPATH tests focus on endocrine, gastrointestinal, immunological, metabolic and nutritional balance. USBioTek holds over thirty plus years of experience in the industry and has become the trusted name in today’s cutting-edge immunoassay technology. Fully automated robotic systems form the framework of the state-of-the-art high-performance ELISA platform; a framework built on the foundation of a world class team of scientists and technicians. Every analyte tested for every immunoassay is run in complete duplicate for precision, that is, consistently reproducible results. From identifying inflammation in the body, nutritional deficiencies and imbalances, to environmental toxicities, food allergies and sensitivities, Rebuilding Health through Innovative Testing is the guiding principle at US BioTek.